The foundation stone of the Church of Ireland parish Church in Bantry, County Cork was laid two hundred years ago this month on 23rd October, 1818. To mark the millennium in 2000, the Church was dedicated afresh as the Church of St Brendan the Navigator, Bantry. A statue of Saint Brendan the Navigator stands on Wolfe Tone Square in Bantry outside the church. 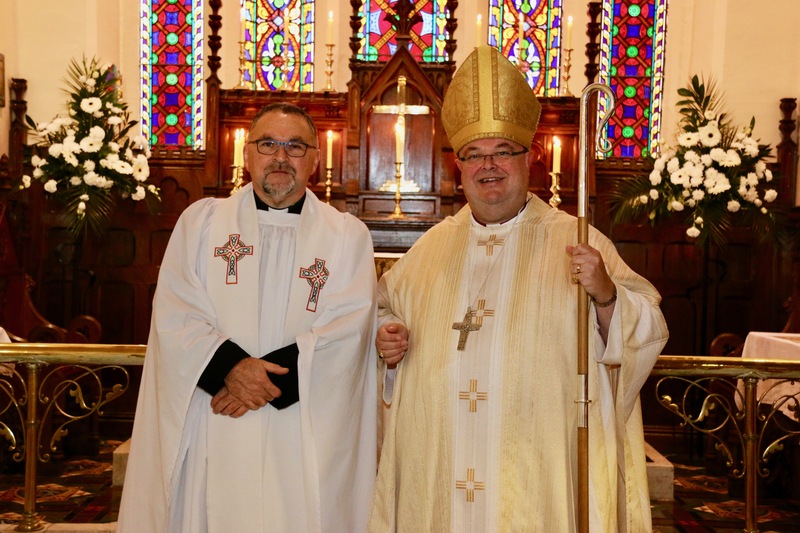 Canon Paul Willoughby, Incumbent of Kilmocomogue Union of Parishes with the Bishop following the Bicentenary Festival Eucharist. On Sunday 7th October, the Dedication Festival, the Bishop of Cork, the Right Reverend Dr Paul Colton, visited the parish, and presided and preached at the bicentenary festival Eucharist. 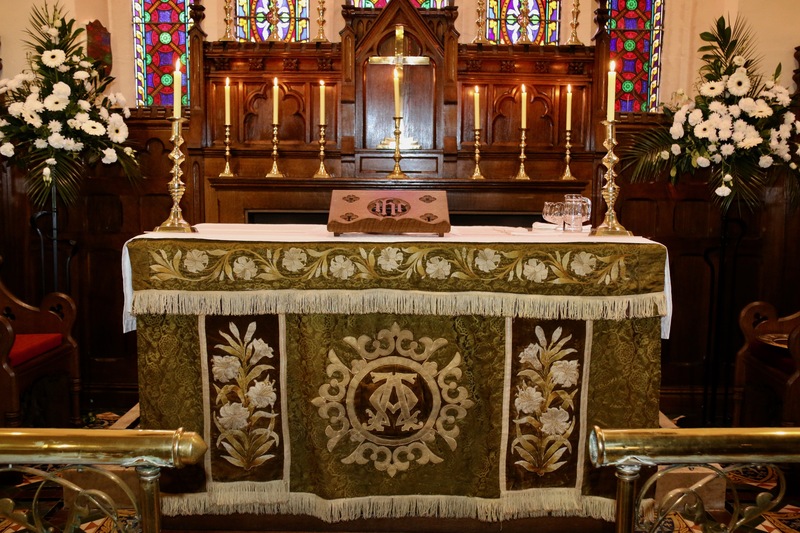 To mark the bicentenary a parishioner kindly restored a beautiful altar frontal which had been in use in the Church until 1952, when it was moved temporarily to Rooska Church. Rooska Church having closed some decades ago, the restored altar frontal is in use once more in Bantry. Throughout the weekend, from 5th to 7th October there was also a Flower Festival to mark the beginning of a month of bicentenary celebrations. 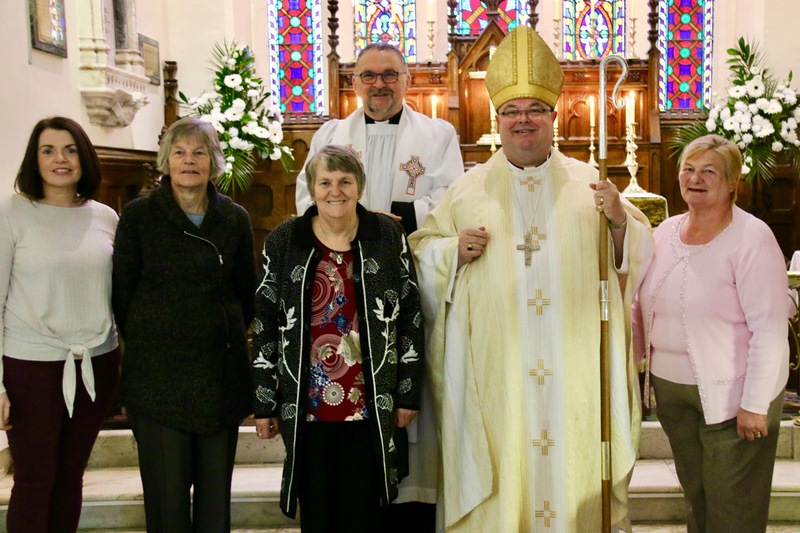 Following the Service, with the Rector and the Bishop were (l-r) Lorna O’Donovan, Judith Payne, Mary Draper, and Mary Levis. This entry was posted in Bicentenary, Bishop, Church Services, Churches in Cork, Parish News. Bookmark the permalink.